Where can you find the worst weather on earth? The surprising answer in Tying Down the Wind is: everywhere. You don't need to climb Mount Everest or voyage to the icy desert of Antarctica to witness both the beauty and the destructiveness of weather. The same forces are at work in your own backyard. Whether you fly a kite in a soft summer breeze or shovel snow after a January blizzard, the dynamics of wind and weather remain the same. Eric Pinder, certified observer at Mount Washington Meteorological Observatory, takes listeners on a voyage of discovery through the atmosphere, a swirling ocean of air that surrounds and sustains life. The journey begins in a sunny New England woodlot and ends atop the polar ice of Antarctica - where we learn, remarkably, that the two extremes are not so different after all. What triggers changes in the weather? How are tornadoes, thunderstorms, heat waves, and blizzards all related? 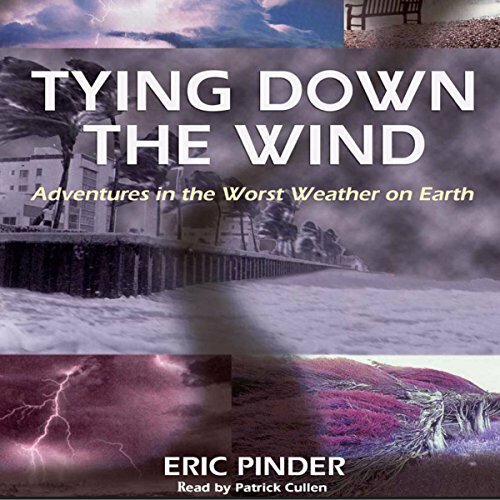 Tying Down the Wind supplies the answers and invites you to experience the excitement of the world's worst weather in the comfort of your own home. Tying Down the Wind suffers from too much poetry, and not enough content. Descriptions are sometimes hard to follow in audible format, such as how tornados, hurricanes, or other weather patterns form. With all the poetic descriptions of his surroundings or the people, I often found my attention drifting to other things; few other non-fiction books have caused me to do this. At the end of the book, I find I didn't learn very much about the weather. Finally the book just never really went anywhere, it didn't build up to anything. For a good example of how a non-fiction book can do this, check out Flu, an excellent, well-researched, well-written book about the Influenza of 1918 and modern day efforts to track it down. Poetry can be a wonderful thing. This is not a textbook of meteorology. It's the poetry of weather. If you're looking for the best ratio of fact per dollar this is not the book for you. If you'd like to hear about storms on mountain peaks, the majestic dance of clouds, the people who's lives were in some way changed by their encounter with the forces of weather.. from folklore and fable to software and radar, this could be the book for you. Tying Down the Wind is the sort of book that takes you on a journey. Similar to Carl Sagan's Cosmos in some respects, it reminds us of the beautiful, lonely and epic forces of nature that are all around us. Sit back and let it carry you away on the wind.. While full of interesting information about our weather the book could be about half as long were the writing better (way too heavy on flowerly adjectives). Also the narrator is very monotone and results in the reader falling asleep more than happens with other books. A good book for those interested in the science of weather. But, it is a little long on the flowery writing. Still, it is worth reading for the weather information and true stories about life on Mount Washihngton. I believe it is the only weather book on audible right now. Lots of good information. An interesting read. You will likely come back to this book to catch some of the things you missed the first time. Good, solid information well presented. While there was some interesting information in the book, there was way too much poetry for my tastes. Information about how he recaptured the sheep that got out of their pen just doesn't interest me. This book is good and well written but drags a bit and goes on and on. If you are really into weather then get it but not really a light listen.